What Is Cancer? Learn the truth that you probably never thought about. Cancer is natural. It is a natural response to an unnatural environment. So what is cancer? What the video and find out. And don’t forget to share with your loved ones. 1) QUESTION: CAN A MEMBER HOLD PARKING SPACE / STILT IF HE HAS PURCHASED THE SAME? ANSWER: Builder has to provide a mandatory parking space to a certain number of flats dependant on the size of every flat as per the provisions of the Development Control Regulations. Parking space is not counted in F.S.I calculation and is the property of the society. Hence, by the same reason and also as IN THE HIGH COURT OF JUDICATURE AT BOMBAY APPELLATE JURISDICTION FIRST APPEAL NO. 2182 OF 2007, Nahalchand Laloochand Pvt. Ltd .Appellant Vs. Panchali Co-Operative Housing Society Limited., versus Panchali Co-Operative Housing Society Limited, the Builder is NOT entitled to sell you Parking Space outside the FSI consumed which was further confirmed IN THE SUPREME COURT OF INDIA CIVIL APPELLATE JURISDICTION CIVIL APPEAL NO. 2544 OF 2010, Nahalchand Laloochand Pvt. Ltd. Apellant Vs. Panchali Co-operative Housing Society Ltd.
2) QUESTION: WHETHER THE ALLOTMENT OF PARKING SPACES / STILTS SHALL BE MADE BY THE COMMITTEE ON THE BASIS OF ‘ FIRST COME FIRST SERVEDOR UNSOLD AND AVAILABLE PARKING SPACE? ANSWER: Builder has no right to sell any car patking space. The reason is when a flat purchaser is purchasing a flat, he is paying certain amount for the common areas and amenities appurtenant to the primises. The common parking area / stilts is the property of the said society as per the said High Court order and also as per the various provisions of DCR & MOFA Act. But, be advised that this common parking area does not include the parking space that is reserved for each flat as per the provisions of DCR. Hence, this common parking space is the property of the society and the society can allot it on ‘First Come First Serve” basis or in any other manner in accordance to decisions of all the members, within the frame work of the Model Bye-Laws & MCS Act, 1960. 3) QUESTION: WHO OWNS THE CHS PARKING SPACE? 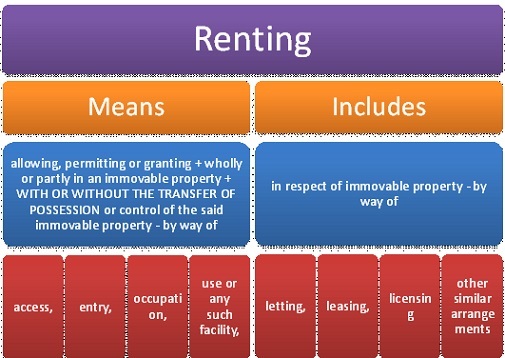 e) Tenant’s are Nominal Members and have no rights of a regular member, which includes having no rights of parking of parking in the CHS premises. However, at the discretion of the MC, parking can be an extended as humanitarian facility to the nominal members. f) Parking area (Stilt, Open or whatever) is not covered under Floor Space Index (FSI) and hence is not saleable, as upheld by the Supreme Court in the case of Nahalchand vs. Panchali CHS. various BMC & Fire act rules and has got no force of law, in Court of Law. 4) QUESTION: CAN THE MC REFUSE TO ALLOT PARKING SPACES TO ITS MEMBERS ? d) The MC is bound not to violate the LOP & DC Rules & Fire Act rules, regarding the way common spaces are to be maintained. 5) QUESTION: WHAT IS THE TYPICAL PARKING CHARGES LEVIED BY CHS? a) Parking charges may be determined amongst the GB members, directing the MC to implement the GB directions. b) Parking “charges”are not equivalent to Parking “penalty” for violations of Parking spaces & usages. c) Parking charges may be from 10/- to 10,000/- or anything per vehicle, per month, BUT as decided by the GB, BUT this is again applicable “ONLY” to Registered members including his family members and associate members. d) Nominal member is not a registered member. Hence parking charges do not apply to him. Hence Parking space can be denied to Nominal members, even if parking space is allotted to registered members including his family members and associate members, since Parking space is not a right granted to the registered members. 6) QUESTION: WHO IS RESPONSIBLE FOR MAINTANANCE OF PARKING SPACES? a) The MC is responsible for the upkeep & safety of the Parking spaces and for the safety of the members Parked vehicles rwsonable precautions may be taken by MC. c) The member who parks his vehicle with the permission of the MC and pays Parking charges, can file Civil Cases, Criminal Cases and Consumer Court cases, against the CHS, for any “Negligence & Deficiency” in parking facility, vehicle damages etc…. 7) QUESTION: CAN PARKING DEPOSIT BE COLLECTED? a) Parking space is a Common area and Deposit for Parking space cannot be collected, even if passed by the GB. b) MCS RULE 39 restricts rights of society to raise funds. c) Deposit means refundable, interest free, or whatever. 8) QUESTION: HOW TO ALLOT PARKING SPACES? a) Depending on the number of lawful Parking spaces (under BMC rules) and number of member vehicles, Parking space may be tentatively allotted on yearly Rotation usage system, which depends on cyclic First Apply First Allotment system. parking requirements are not fulfilled. a) Penalty in a CHS is a “Fine” for violations of the CHS rules & conditions and Resolutions passed in the GB directing the MC to implement the GB directions applicable to them. b) Penalty amount may be fixed and decided by the GB and but levied to a member only after after giving opportunity to the member. d) In case of dispute of Penalty amount levied by the MC, the member may approach the local Ward Deputy Registrar / Assistant Registrar of Co-operative Housing Societies, for redressal of his grievances. As per New Model Bye Laws (as amended in 2009) Bye Law No.166: The general body meeting, after considering the say of the member and after giving him hearing, may levy penalty at the rate fixed by the meeting of the general body of the society but not more than Rs.1000. MOFA, is very clear on a part of parking space, stilt and open to sky. Builders do not have any right to sell these spaces, as per lot of judgments. In spite of Supreme Court judgment, some of the builders are known to sell such spaces for lakhs of rupee. If anybody wants to fight, our litigation system is so lengthy, and expansive. As per D.C. Rule builders have to keep 10% (increased to 25% in some areas) parking space in every building project, reserved for the visitors. Under Section 78 of MOF Act, The allotment of parking space/ stilts shall be made by the Managing Committee on the basis of ‘first come first served’ for unsold and available parking spaces. In a judgment by the Maharashtra State Consumer Disputes Redressal Commission authenticated the Cooperative Housing Societies that they can redistribute parking spaces sold and allotted by the Developer after adopting a suitable bye-law. 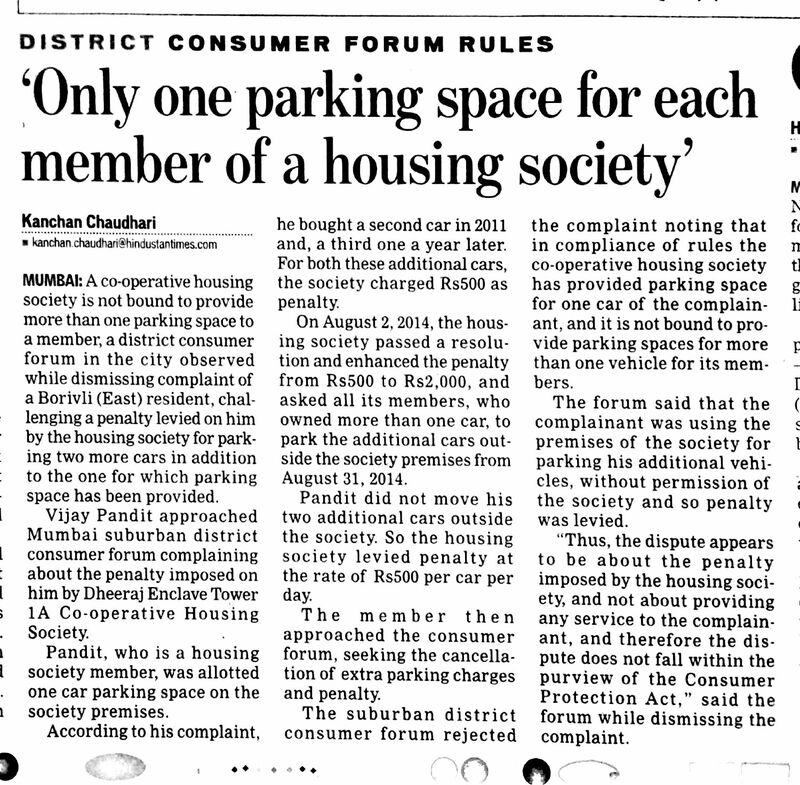 The Commission ruled that the allotment of parking space is a matter that has be decided by the Housing Society. The Commission’s verdict was delivered on February 21, 2012 while deciding a complaint filed by Thane-based elderly couple. The complainants who had purchased a flat in one of the Housing Societies in Thane, had approached the Commission in May last year after they were physically restrained by employees of the Developer from parking their vehicle in a stilt parking space sold to another flat purchaser in the same Society. The complainants alleged that they were thereafter compelled to park their vehicle outside the Society compound. The Commission ruled that Managing Committee of the Cooperative Housing Society can now decide fresh parking arrangements by cancelling the allotment of parking spaces made by their Builder by adopting a suitable bye-law. The complainants sought compensation from the Developer for selling parking spaces in breach of provisions of the Maharashtra Ownership of Flats Act, 1963. The Developer contended that he had never agreed to sell or allot any parking space to the complainants. The Commission discarded the Developer’s contention, reiterating the settled legal position that the Developer cannot sell or allot any parking space, which forms part of the common amenities of the Housing Society. Posted on June 24, 2013 Categories Greenpeace IndiaLeave a comment on Biotechnology Regulatory Authority of India (BRAI) bill stalled again!